Valentine's Day is back Mercenaries and it's only a week away! 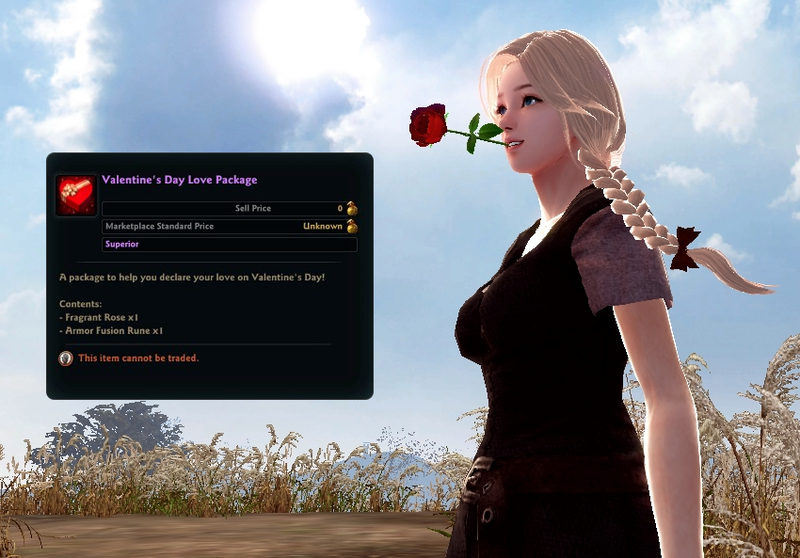 Find your true love with the 'Valentine Hearts Event,' and go on to pick up the 'Valentine's Day Love Package' to clutch a rose between your teeth. Then, finally, get you and your sweetheart matching 'Devotion Rings' before the big day! The Strange Traveler's feeling lonely and while the prospects of his love life may be at least as terrifying as a Fomor horde, that's no reason not to cheer up the little guy. Find your match or join the Strange Traveler in bachelorhood and gain a new title and a pair of grand emblems! Open the package to receive a pair of random Heart halves, one bound to your character and one that is tradable. Find another player with the other half of that heart and trade your halves! Use the bound Heart to create a full Heart! Bring the Heart to the Strange Traveler to receive the "Better Together" title scroll, and Emblem: Shining Gremlin or Emblem: Karma. Alternatively, if you cannot find another player with the hearts, speak to the Strange Traveler to give up, and receive the "Proud Loner" title, and Emblem: Shining Gremlin or Emblem: Karma. Event can only be completed once per account. We apologize for the lack of clarity. Please note that you can only match the original pair of heart halves you obtain from the Strange Traveler. Thank you for your understanding. The 'Valentine's Day Love Package' contains two simple items: A lovely, red 'Fragrant Rose' for your mercenary to hold between their teeth as headgear item, as well as an 'Armor Fusion Rune' to make your favorite helmet hold the appearance of your new flower. 'Fragrant Rose' is a headgear item with no stats. 'Armor Fusion Rune' can be used to transfer the appearance of one gear item to item, provided they can both be equipped and in the same slot. Of course, nothing quite spells devotion like a gorgeous ring. The 'Valentine's Day Devotion Ring Box' lets you give your favorite someone a personalized ring providing ATT and DEF, etching it with their name while you keep one for yourself. Tradable Devotion Ring etched with another character's name. 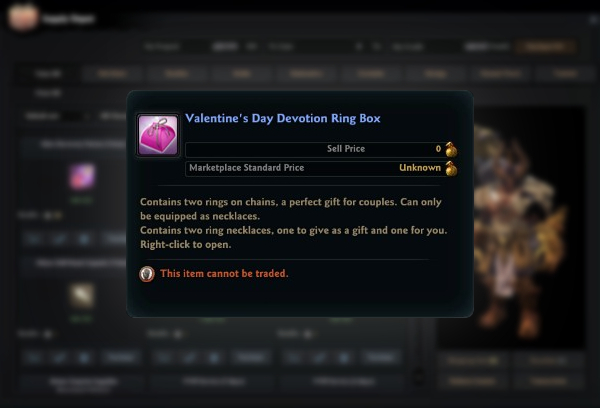 Devotion Rings last for 30 Days. This is a special seal package for heroes who have reached their peak potential.